An ST door is made from steel sandwich panels (sections) that fit seamlessly together using a male/female construction. The individual panels are filled with a polyurethane foam care (CFC-free) and are also thermally separated. Hence the panels have no thermal bridges, which means they offer optimum insulation. ST panels are 40 mm thick; the front and back are fabricated from 0.5 mm galvanized steel sheet in the standard colour RAL 9002. This thorough preliminary treatment gives the panels a long life. Moreover, ST panels are finished in a stucco design that gives the doors an even more attractive appearance. Incidentally, for a slight additional price, the panels can be supplied in nearly every conceivable RAL colour. ALU panels have the same specific characteristics as ST panels, but they have a more impressive appearance. This is because the front and back of the ALU sandwich panels have an aluminium finish (stucco design). 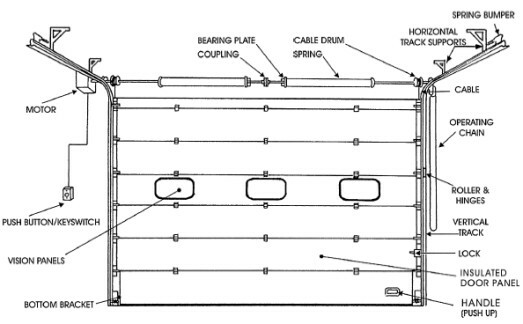 ST and ALU overhead doors are fitted with galvanized steel end caps and aluminium top and bottom profiles; the latter containing rubber seals. 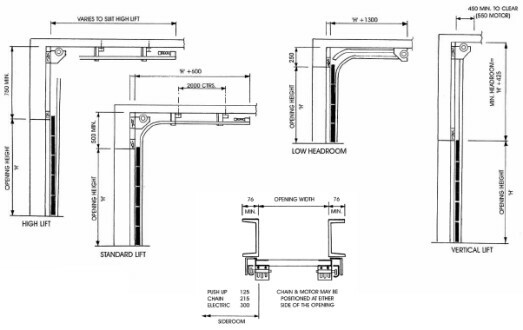 The entire AR door consists of sections made of robust aluminium profile. Dependent on your requirements, these sections can contain various elements, such as 21 mm thick acrylic double glazing, single acrylic glazing, impact-resistant polycarbonate, single safety glass or 21 mm thick sandwich panels. The aluminium section can be supplied in practically every desired RAL colour. The section height is variable within certain limits; So, in the final overhead door, all the sections have the same height. 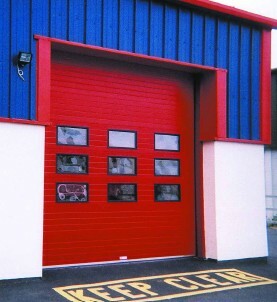 The AR door has a luxurious appearance and is, partly due to the amount of transmitted light, especially suited for demonstration areas such as garages. There are various options in the area of safety and security including protection against spring and cable break and slack cables, the doors can also be fitted with a safety edge and a pass door switch. aluminium AR section (ST, ALU and AR): anodised as standard. If desired, coloured acrylic can be used in AR sections. Note: Horizontal tracks can be supplied sloped to suit pitch of roof.